Discussing the impact of real-time web at Groupama's GTWeb 5/5/09, originally uploaded by rsepulveda. Read the article here, thanks to Philippe Guerrier for the chat. "More than 147 million U.S. Internet users watched an average of 92 videos per viewer in October." > this number is going up, about 5m more in 3 months, getting the reach in the USA from 75% to 77%. The number of videos viewed is differnet per site, Youtube only captures about 53 videos per person, whereas hulu.com gets about 10 a month. BUT THE MORE INTERESTING FACTOR IS HERE : hulu.com has a reach now in the USA of 24m, vs Youtube of a reach of 100m. 24%... Average video length (no number for youtube specifically, anyone has it ? ), is 3 min. average length on hulu is 12 min. So youtube streams 3min x 99,5m people x 53,2 videos / 60 = 265m hours / month. Hulu streams 9,8min x 24m people x 9,8 videos / 60 = 45,5m hours/ month. That's 17% of Youtube. Now in previous reports, Youtube only monetizes 4-6% of its inventory. Let's say 5%. Hulu 100%. hence Hulu can monetize 45,5m hours. Youtube can monetize 5%*265 = 13m hours... That's 3x less than Hulu for a site that has 4,5% of its traffic... Latest numbers I've read (maybe totally wrong) is that youtube is doing $100m this year, and hulu.com reports doing $70m... not bad. If my maths are not wrong, monetizing 5% and 100% respectively, at $70m and $100m revenue respectively, traffic at 245m and 5,2b video views respectively, and assuming 100% of the inventory is monetized with CPMs, hulu.com is reaching almost a $300 CPM while youtube is reaching a $1 CPM... doh. To be fair, if you look at costs, hulu.com should have only 17% of costs of youtube in terms of streamed hours. Actually that's true for bandwidth, CDNs, probably not really for servers, they must have a large installed base also to handle the load. All in all, assuming a random scaling factor, let's say hulu.com has costs that are x2 or x3 more than youtube (the google effect behind). Hence 34% to 51% of youtube's costs. With 70% of revenues of youtube, I think I like hulu's model so much more ! including the UI of course. Finally, there's a hiccup in this discussion. Although youtube is doing rev-share with some of its content publishers, hulu probably has to do rev-share with rights-holders as well. And in the movie business (including TV series), there's a thing called MINIMUM GUARANTEES, that you pay usually upfront to get the right to broadcast a catalogue. This happens so that there's a minimum income for the studio, that it justifies fixed costs, etc. In addition, MGs tend to be charged by territory, hence even more expensive if you want a global footprint for your service (hulu is only in the USA for the moment, so get a VPN ;). This challenges clearly the COGS structure of a hulu.com, and as a matter of fact any new entrant who'd like to compete with hulu. They'd face the same issues. longer viewing experience allow for new video ad formats (overlays, mid-rolls), hence increased revenue streams. Anyone else has more numbers ? different thoughts ? 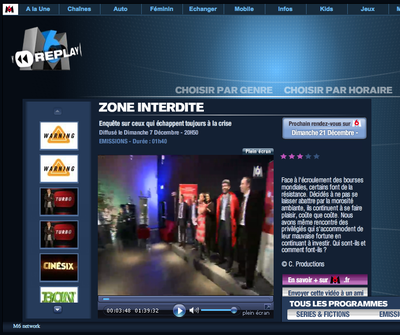 You may watch the whole event again on www.M6replay.fr. They aired the moment when we, as sponsors, we took the stage. For more details, the Mry & Rodrigo Show 63 of course. 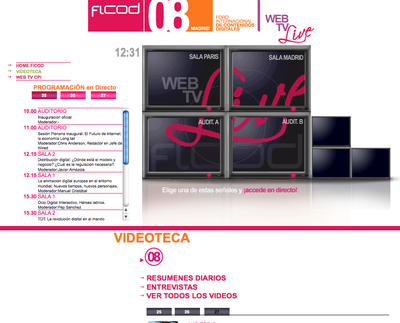 My long-time business partner, Ivan Communod, and I started working on the original concept of vpod.tv in September 2005, when we realized the growing importance of UGC + growth of fixed and mobile bandwidth + development of video-enabled devices. We were frustrated that we couldn't publish videos easily online. We tell the story here. After developping a first prototype, we went fund-raising, and closed a 4 million euros Series A with Frédéric Humbert, GP at Innovacom, a few days after we incorporated the company in France on May 15th, 2006, slightly over 2 years ago. Along the way, a select group of business angels have joined us as shareholders, including Internet entrepreneurs Martin Varsavsky and Loïc Le Meur. We went into exactly one year of product development based on our original prototype, changing our business model from our original B2C concept into a pure B2B SaaS play about 6 months later (end of 2006) when we realized it was a B2C market game over when YouTube got acquired. We opened a first beta version of our v1.0 to the general public both on the web, mobile and on a number of different products. You can see our first product on http://studio.vpod.tv. On May 15th 2007, we opened up for business, exactly 365 days after incorporating. We are glad to report that we have now over 50 live customer refererences in 4 sectors: global brands, media groups, telcos and e-commerce services. By May 15th 2008, we knew that we had a proof of concept with very solid business cases in each of our markets and that is was time to "move on to the next level". We have hence been massively preparing for international expansion, and have completely re-written our platform, packed with new features (support for over 200 file formats, carrier-grade infrastructure, advanced backoffice tools for real-time configuration + statistics + moderation, etc.). Version 2.0 should launch in September, as we already have a nice number of very high-profile customers running it on a day-to-day basis. As any entrepreneur knows, the road to success and rapid expansion is a very bumpy one. Fortunately for us, many others have already traveled that road and can help us make the right decisions and avoid the pitfalls of rapid growth. We have therefore reached out to the folks we feel can best help us grow our company, and who share a deep passion for entrepreneurship, technology and media. 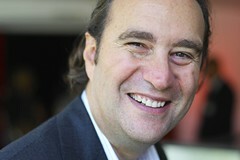 Ivan and I are delighted to announce our new advisory board member, and new investor, M. Xavier Niel, founder and Chief Strategy Officer of the Iliad group, better known in France under the brand free.fr (see Wikipedia). Xavier is an exception in France: he's a fantastically gifted entrepreneur, having totally disrupted the French telecom market and in my opinion, the man that made France a global Broadband leader. 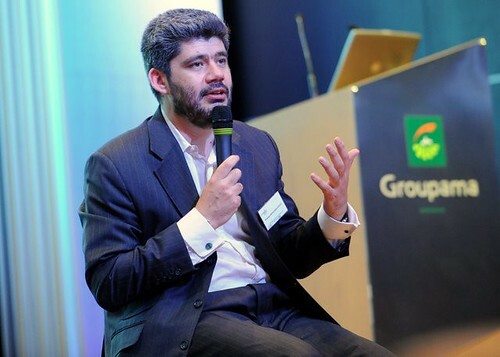 To me, he is totally focused on key values that we love to love, such as among other things: an incredible charisma, a commitment to enhanced customer value proposition, a deep focus on cost and margin control, a spirit of continuous innovative services and a visceral competitive nature. His personality was best captured last year in a lengthy profile by my friend journalist Om Malik. A very large part of our business at vpod.tv is managing our technology infrastructure: bandwidth, storage, servers, SLA monitoring, growth management, etc. an area managed by Ivan on the technology side, and by me on the business side. Xavier was a natural fit and his role will be, along with a mentoring role, to help us keep our edge on the technology side, hence helping our customers benefit from this expertise. We are honored and excited to have him on board. I had almost forgotten about this interview, taped at SIME'07 in Stockholm last November. 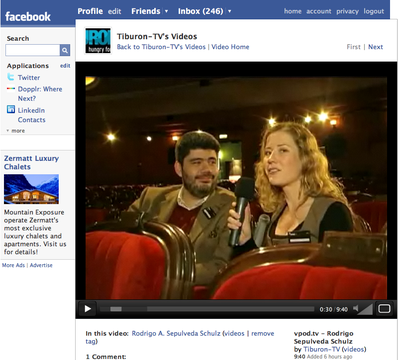 Viktoria (the Journalist for Tiburon TV - "hungry for business") had the whole theater just four ourselves at the end of the conference. 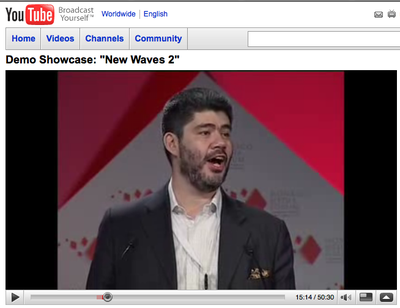 Here I talk about our business at vpod.tv and about entrepreneurship. Thanks Viktoria for a nice time ! Facebook has extended that great feature they had on pictures to videos: I got pinged in my email inbox about this video because they tagged me in the video. Hey, I also appear in this little clip at LIFT conference (I had never noticed it before on Facebook video). 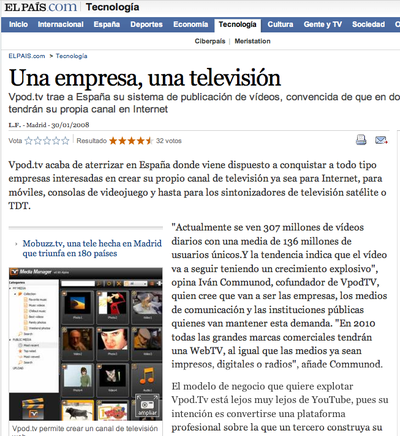 Really nice article about vpod.tv in El Pais, the leading spanish newspaper. Thanks for the article published in January (I had forgotten to blog about it). Ivan did a good job explaining our work.